← myth of Tibetan mastiff. For serious dog aficionados, this is a seriously important book.The ‘Encyclopedia of K-9 Terminology’ has special relevance to breeders, dog show judges, participants and viewers, veterinarians, and other dog fanciers who are keen to learn more about canines. What’s amazing is the number of terms and concepts covered in this tome. This is an informative, technical lexicon of canine terminology that anyone seriously involved with dogs will value. It is a tremendous aid to understanding the sometimes arcane and specific vocabulary associated canine science, breed standards, and description. There is so much in this huge book, however, that no short review can possibly do it justice. But, I’ll do my best. Grooming, Showing and Judging (26 pages). Part 4 on Canine Anatomy is the longest section. It begins with the Dog’s Head, Braincase/Topscull/Backskull and Occiput and concludes with Tail, Rear Legs, Thighs, Knees Hocks and Rear Feet, with many more topics in between. Entries (from ‘Abdomen slightly tucked up’ to ‘Zygote’, 47 pages). Breeds (Affenpinscher to Yorkshire terrier, 11 pages). Illustrations; i.e., body types, with specific descriptions by breed ¾ e.g. (at random), Shoulder Blade Layback, Elbow Joint Length to Height Ratios, Loose Skin, Tight Skin, Corded Coat, Whiskers, Head Types, Ears, Eyes, Muzzles, Noses, Chops, Lips, Flews, etc…). The Illustrations and Figures are clear and informative, mostly line drawings and sketches prepared by artist Dan Sayers. After perusing the entire volume (no small achievement, given its size and comprehensiveness), I focused my attention on Part 8, ‘Dog Breeds’. I was specifically interested in finding references to the AKC recognized Tibetan Mastiff (hereafter ‘TM’), the breed with which I am most familiar. There are 10 mentions of the TM throughout the book, but only one in Part 8, which seemed strange to me. Perhaps it is because the TM is a relatively rare breed and new to most dog show judge. So, I can’t be too harsh a critic of what’s missing about TMs. Besides, I had a great deal of fun, as you will, in pursuing my search. First, I wanted to see what the authors said about TMs in terms of body type, temperament, and purpose. In so doing, I kept an eye out especially for comparative references to ‘mastiffs’ of all types. I must point out right here, however, that one of the basic arguments in my book, ‘Big Dogs of Tibet and the Himalayas’ (Orchid Press, 2010/11), is labeling the TM as a ‘mastiff’. (That name dates back to the early 19th century, as described in the book.) TMs are not true mastiffs. A more appropriate name is Himalayan (or Tibetan) Mountain Dog. I found the TM mentioned 10 times throughout the book, but only once in Part 8, where there are a half dozen categories where it should rightly be noted. Before continuing, as an aside, I learned some interesting new terminology under ‘Breed Nicknames. For example (at random): “Apollo of dogs” (Great Dane); “Big for his inches” (Beagle Standard); “Black devil” (Schipperke); “Perfect demon” (Norfolk terrier); “Tibbie” (Tibetan spaniel) and both “Estate guard dog” and “Mastino” (for Neopolitan mastiff). And for sure, there are many more nicknames out there waiting to be added to the list in a future edition of the book. Then, within Part 8, I focused on the first two categories, namely ‘Classification… [by] Purpose’ (pp.580-589) and ‘Working Dogs’ (pp.590-596). My first surprise was that the Tibetan mastiff appears nowhere under ‘Classification… [by] Purpose’. I fully expected to find it there under the relevant sub-categories of ‘Livestock guard dogs’, ‘Watch dogs’, and ‘Working guard dog’. Under ‘Working Dogs’, however, it appears, but only once as a ‘Family and property guardian’. The authors write that “The Tibetan Mastiff has been used primarily as a family and property guardian for many millennia, and is aloof and watchful of strangers, and highly protective of its people and property.” Fair enough (except, of course, that it is not a true mastiff). But why is it not listed under the other livestock and guard dog sub-categories? The other dogs listed as ‘Family and property guardians’ bear little resemblance or functional relationship to the TM, neither the Dogue de Bordeaux “a molossoid (mastiff-type dog)”; Cane Corso “an ancient Italian breed, a medium-large size Molussus Dog...”; Great Dane, a combination of “the Irish Wolfhound with mixture of old English Mastiff”, which was first bred by the Germans to hunt boar then “changed to one of a companion and estate guard dog”; or, not least, the Neapolitan Mastiff, originally a war dog that “later existed on estates and farms in northern Italy, designed to be imposing in appearance for use as a defender of owner and property.” There’s a lot to learn b y what’s included in these breed descriptions, and by what’s omitted. Elsewhere under ‘Classification…[by] Purpose” and ‘Working Dogs’ we find other dogs, more well known than the TM, certainly, and with which the TM should be (but isn’t) mentioned. The TM’s primary functions as a big landrace livestock guardian certainly fits the authors’ descriptions of a canine “whose primary function is as a livestock guardian.” Others like it that are listed are Anatolian Shepherd, Akbash, Great Pyrenees, Komondor, Kuvasz, and Maremma (as ‘Livestock guard dogs’), and Shetland Sheepdog and English Mastiff (as ‘Watch dogs’). My point here is that the Tibetan mastiff should be listed alongside those others, above, under ‘Working livestock guardian dogs’, ‘Livestock guard dogs’, and ‘Watch dogs’. I am also puzzled that the term Molosser, or Molussus, is not one of the ‘Breed Varieties’ or a ‘Breed Type’ in this book. It only appears, for example (almost as an afterthought), where the Dogue de Bordeaux is described as “a molossoid (mastiff-type dog).” It is also interesting that the term ‘landrace’, as a concept especially important when considering a dog’s historical role and function, is not in the Index. What all this tells me is that this gigantic ‘Encyclopedia of K-9 Terminology’ is so big, so comprehensive, and so complex (as the world of canine nomenclature and esoteric is generally), that errors and omissions are bound to occur. Such errors do not, however, diminish the great importance of this tome. They can be fixed in subsequent editions. And since a few errors and omissions do not detract significantly from the value of this book, I‘ll repeat my initial endorsement — For serious dog aficionados, this is a seriously important book. There’s nothing else quite like it, or quite as useful for dog fanciers, judges and veterinarians. 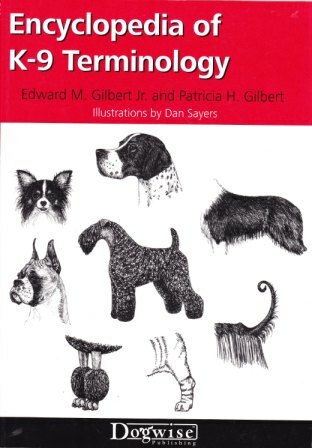 Encylopedia of K-9 Terminology, by Edward M. Gilbert Jr and Particia H. Gilbert. Paperback, 7”x10”x2” (4 lbs. ), 832pp., 401 b/w illustrations. ISBN 978-1-61781-126-5. $49.94. Dogwise Publishing (Wenatchee, Washington). At Dogwise, contact Kristy Allen by email at kristya@dogwise.com, or by phone at 800.776.2665, ext.131. ‘Do-kyi’ (or ‘Dokhyi’), Tibetan meaning “tied dog” (as it often is during the daytime in shepherd and yak herders’ camps, but is released to run free at night) or “door guard dog” (reflecting its importance in guarding herds, flocks, tents, monasteries and palaces). Nowadays it is also seen in Tibet guarding modern factories and other non-traditional properties. ‘Kyi’, or alternatively ‘Khyi’, means ‘dog’ in Tibetan, as discussed in my book. This entry was posted in BOOK REVIEW, Books about Dogs, Canine Science. Bookmark the permalink.